1. Conifers (often called "pine trees") in tropical countries have their origins in a landmass known as Gondwana. India was detached from Gondwana approximately 90 million years ago. India then collided with Asia 30 - 45 million years ago and exchanged species. Later, as Australia - New Guinea drifted north, the collision of the Australian and Asian plates pushed up the islands of Wallacea, which were separated from one another by narrow straits, allowing an exhange of plants between Indomalaya and Australasia. Asian rainforest flora, including the dipterocarps, island-hopped across Wallacea to New Guinea, and several Gondwanian plant families, including podocarps (i.e. Southern Hemisphere conifers), moved westward from Australia-New Guinea into Southeast Asia. 2. Pine cones are the reproductive parts of conifers. There are both male and female pine cones. Male pine cones are soft and small. Female pine cones start out soft, green and sticky. They grow into hard brown woody cones to protect the seeds after they are fertilised. 3. The female pine cones grow for a few years while the seeds mature, then they open up to let the wind distribute the seeds. 4. Pine cones that you find on the ground are female pine cones that have completed their reproductive process, and so it is usually alright to pick them up. 5. Many species of birds, squirrels and tree shrews feed on pine cones. Humans also eat parts of the pine cones -- Pine nuts! Pine nuts are usually toasted to improve their flavour and texture. There are around 20 types of pine nuts that are edible by people. Many people enjoy picking up pine cones to decorate their homes or make crafts with. 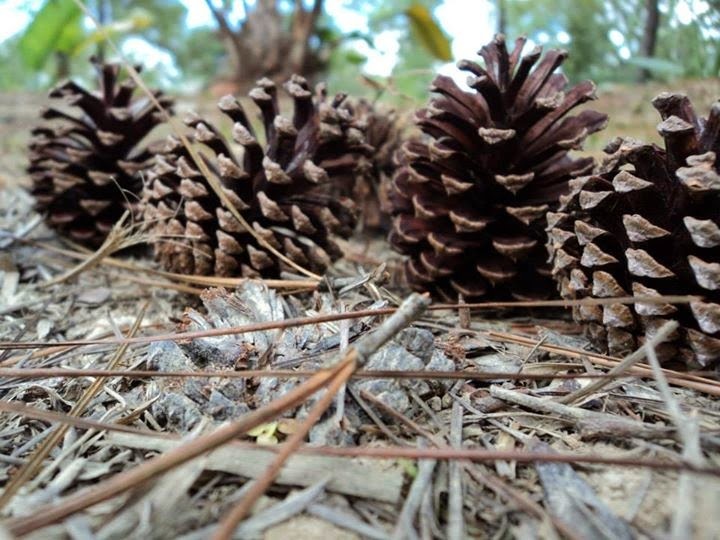 Here are some guidelines as to what types of cones you may or should not pick up, and what you can do with the pine cones that you have collected. 1. Do not collect pine cones or seed pods from rare plants, or those that produce only a limited amount of seeds. If you are in the jungle with a guide, your guide will usually be able to tell you if a tree is rare. You can also refer to botany guidebooks. If the conifer is growing in a park, resort or garden, it is safe to assume that it is not a rare plant and you may collect its cones. 2. Collect only the pine cones that are ripe and have completed their reproductive process. It is safest to collect those that have already fallen to the ground. 3. Pick up each pine cone gently and check to see if any insects or small living animals have made it their home. If there are ants, worms, spiders and other animals living in the pinecone, then gently put it (don't throw or drop it) back where you found it so that the animals can continue living their lives in peace. After all, you would not like it if somebody came and uprooted your home and harshly shook you out of it! 4. Consider sowing and germinating any seeds you may find. The seeds are usually located under the pine cone scales. Shake the cones to collect the seeds. You can plant them directly in soil if you have the space to do it, or you can plant them into planters to be replanted at parks or roadsides to provide shade and beauty. You can even donate your plant to MNS to be planted in their office compound. The woody brown appearance of pine cones make them ideal little owls. 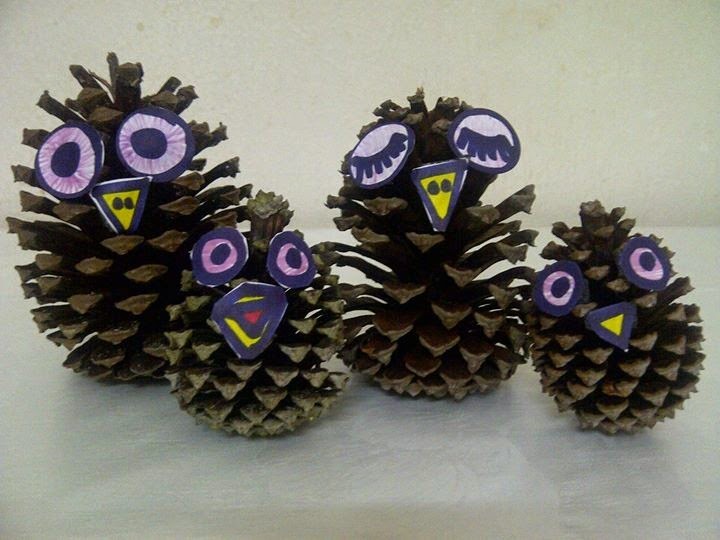 The eyes and beaks are attached to the pine cones using double-sided foam tape. If you wish to compost or plant your pine cone owls after you have grown tired of them, just peel off the tape, which is not biodegradable. Pine cones make popular decorations during Christmas because people associate them with winter and cold climates. Also, they look perfectly like miniature Christmas trees when placed upside down! 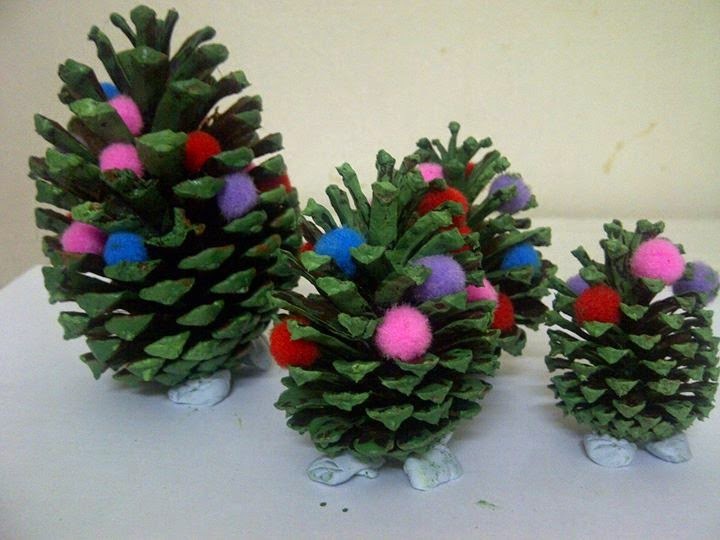 Paint your pine cones with biodegradable paint (Tempera paint is non-toxic and usually safe for such purposes) and decorate them with glitter, cotton wool, mini pom-poms or colourful pipe cleaners to give them that festive look!